3.1 Phillip Lim dress with pleats and asymmetric ruffle detail. Spread collar; partial button front. Long sleeves; button cuffs. Slim silhouette. Button-up side with self-ties. Mini length. Cotton/nylon/Lycra® spandex. Imported. Model's measurements: Height 5'10"/177cm, bust 33"/84cm, waist 25.6"/65.2cm, hips 35.8"/91cm, dress size US 2-4/FR 34-36. Brunello Cucinelli chambray dress with satin insets and monili trim. Approx. 39"L down center back. Spread collar; mother-of-pearl button front. 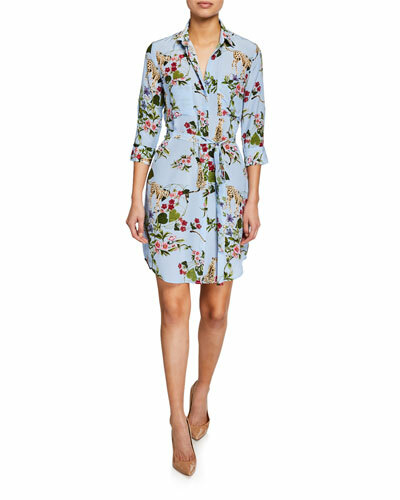 Brunello Cucinelli chambray dress with satin insets and monili trim. Approx. 39"L down center back. Spread collar; mother-of-pearl button front. Adjustable self belt. Chest patch pockets; side seam pockets. Cotton. Made in Italy. Model's measurements: Height 5'10"/177cm, bust 31"/79cm, waist 24"/61cm, hips 34"/86cm, dress size US 0/2. 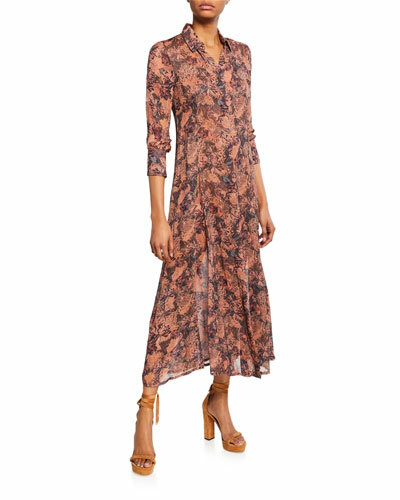 Brunello Cucinelli shirtdress in crinkled cotton. Band collar; button front. Cold shoulders with monili trim. Long sleeves; button cuffs. Self-tie belt. Box pleat at back. Shirttail hem. Knee-length. Cotton/nylon. Lining, polyester. Made in Italy. Model's measurements: Height 5'10"/177cm, bust 31"/79cm, waist 24"/61cm, hips 34"/86cm, dress size US 2. 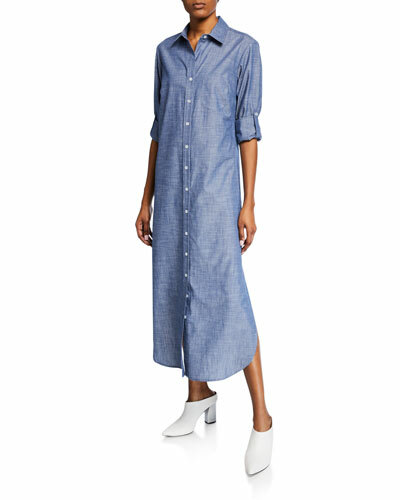 Eileen Fisher shirtdress in cotton gauze. Spread collar; button front. Long sleeves; button cuffs. Relaxed silhouette. Knee-length. Slits at sides. 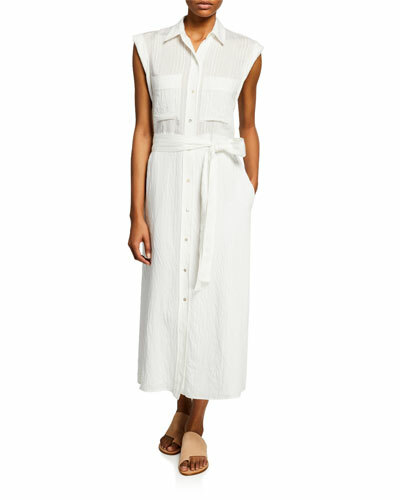 Eileen Fisher shirtdress in cotton gauze. Spread collar; button front. Long sleeves; button cuffs. Relaxed silhouette. Knee-length. Slits at sides. Straight hem. Organic cotton. Hand wash. Imported. Model's measurements: Height 5'10"/177cm, bust 33"/84cm, waist 25.6"/65.2cm, hips 35.8"/91cm, dress size US 2-4/FR 34-36.